Call Ole and Lena’s to Quickly Take Care of Any Accident, Replacement, or Repair! Ole and Lena’s Garage Doors, a Better Business Bureau-accredited company headquartered in the Twin Cities Metro Area, offers professional, reliable repair services on all makes and models of garage doors, garage door openers, and related parts and accessories. 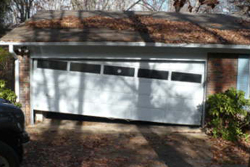 Whatever the root of the problem is, we can help if it involves a failure of your garage door. Our technicians will treat you with courtesy, show up on time, and quickly determine what is causing your garage door to malfunction. We’ll work with you to choose the most appropriate and cost-effective solution, and we’ll use the best tools and products to remedy the problem. For our commercial clients, we offer a full range of services in our commercial garage door service department. We understand that garage door problems do not always come at the most convenient times, and that it’s important for you to get your car out of the garage and continue on your way. Don’t try to make repairs on your own — practice good garage door safety for your Bloomington, Burnsville, or surrounding area MN home and call the experts here at Ole and Lena’s Garage Doors. We are available to help with your garage door repair job 24 hours a day, 7 days a week, 365 days a year. Listed below are some of the most common issues we see and the actions we take to resolve them. Of course, don’t be afraid to call if you don’t see your problem on this list. We practice garage door repair in Bloomington, MN all the time, and will quickly find a way to get your door back to normal. 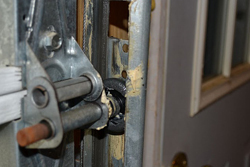 A common problem that afflicts many garage doors is the breaking of a spring. These springs maintain the tension that helps the door to remain in an open position and to close slowly. 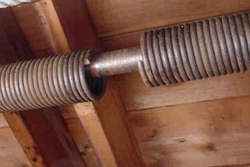 Springs on a frequently used garage door usually need to be replaced every five to seven years. You will know the springs need to be replaced if you try to open or close the door but the door will not move, even if everything sounds and looks like it’s working (the chains will rotate). If you’re in need of garage door spring repair in Bloomington, MN, call us here at Ole and Lena’s Garage Doors and we’ll be there to fix the problem. Cables help raise and lower your garage door, and if they are broken, loose, or frayed, they create a risk for to surrounding people and objects. You can find the cables running vertically at each side of the garage door opening. Make sure to check your cables regularly. Practice good garage door safety in your Burnsville, MN home call Ole and Lena’s immediately to get the problem fixed and new cables installed. It’s critical the track which holds your garage door in place, and the Rollers which allow the garage door to move along the tracks are in good working order. If you notice bent, disconnected, or rusted track, or the garage door makes an excessive amount of noise or shaking while in motion, you are probably in need of some repair. Remember, a well-maintained garage door helps you avoid much more costly repairs and replacements in the future. Choose the most trusted company to repair your garage doors in Eagan, Bloomington, Burnsville, and the Twin Cities Area: call Ole and Lena’s today!